I'm not quite sure when or why I decided that I wanted to visit Sri Lanka, but if I had to guess, it was probably sometime between going to Apollo Banana Leaf in London for the first time.....and going to Apollo Banana Leaf in London for the second time. The second time really sealed the deal. Sri Lanka doesn't receive a whole lot of attention, probably because up until 2009 it was entangled in a long war, but has enjoyed decent tourism lately and good reviews from those tourists too. We had 4 nights and 5 days to spend and decided to go inland into the cultural triangle and hill country. The Elephant Orphanage is worth the visit if you want to get up close and personal with the elephants. Many of the elephants roam around freely, but I was sad that these guys were chained up for feeding up, although I guess it's the only way to get this close to them. 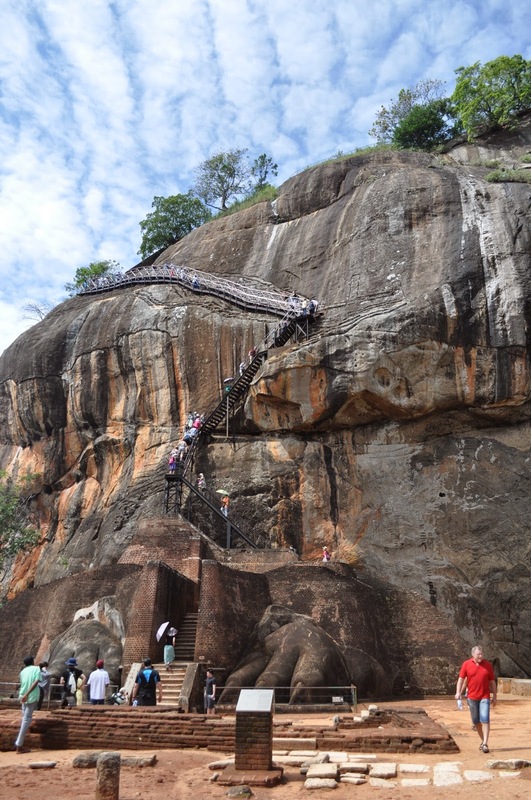 Sigiriya (or Lion Rock) is one of the most visited sites in the country located right outside Dambulla. From far away it just looks like a giant rock, but inside it houses an ancient city filled with beautiful gardens and caves. Kings did so much cool stuff back in the day. The rock shelters were once occupied by Buddhist monks who enjoyed some creative graffiti for entertainment. These were obviously re-done, but the remains of the originals can still be spotted in some places. The ascent to the top of the rock was a little rough given the heat and narrow stairs that didn't look terribly promising. But the view from the top is great, plus there are more remains of the king's playground. We bypassed Sri Lanka's capital and largest city, Colombo, and opted to go to the second largest city of Kandy. It appears that everyone's favorite evening activity is to see some dancing, so we attended the show as well. The series of traditional dances were full of energy, some telling folk stories and others just being pure entertaining. Around sunset, Kandy Lake is a beautiful and romantic sight. Despite being the second largest city, it felt pretty quiet and peaceful. The Temple of the Tooth and Royal Palace is the main sight in Kandy and worth the visit especially at night when the temple is all lit up. Inside is the upper left canine tooth relic of the Buddha, or so it's believed. I don't know. We headed south from Kandy and into the lush hills of Sri Lanka's tea country. The air cooled and clouds rolled in as we climbed further up, suddenly it felt like a completely different country. We stopped at one tea plantation for a tasting and enjoyed the fresh brewed tea leaves. We woke up early to hike to the World's End in Horton Plains park. The entire loop took about 2 hours and was stunning despite being cold and muddy at places. Unfortunately, it was still too cloudy to see anything from the World End, it was indeed a cloud forest. We also stopped by Ella for a night, which seemed like a backpacker town and jumping point to Sri Lanka's eastern coast. Ella town is small but holds a lot of restaurants and bars for backpackers. It is also nestled in tea country which provides beautiful views, like this one from our hotel. With a 1:30am flight out of Colombo Airport, I was so thankful our driver let us hang out at Negombo Beach for a few hours to kill some time. The beach itself is so-so and feels pretty local, but we were able to catch a beautiful sunset in our last few hours in Sri Lanka. In terms of food, it seems like our only options throughout were kothu, roti or rice with curry. We were forced to have rice and curry a few times, most of it was rather bland. When asking for local food, it was just different variations of kothu or roti and it was all very tasty. Kothu reminds me of chao bing which my family in China always made. It's basically some chopped up roti stir-fried with a bunch of stuff. It's comforting delicious street food. Note: When going to roadside restaurants, might as well get a giant family sized portion of kothu and most importantly, plates wrapped in plastic wrap.